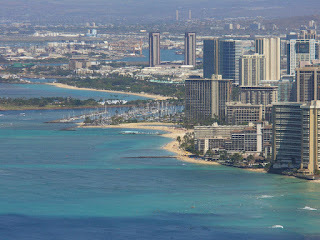 of Diamond Head (Le'ahi). In Hawaiian it means the brow of the Yellowfin Tuna. 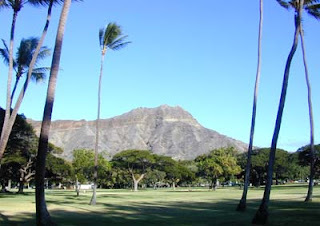 My 11 year old nephew commented when a T-Shirt hawker tried to sell us a T-shirt that more or else said "I've made it to the top of Diamond Head"....I can't buy that T-shirt because it doesn't say "I've Been to Hell"
I wonder if the 99 steep steps leading up to the crater itself had anything to do with his comment? It took us 1 hour to complete the hike up to the top and return down the crater. I believe the tour itself is about 1 1/2 hours long. It was a custom in our home parish run by Capuchins, to attend Mass at a Franciscan church in order to gain plenary indulgence. This day brings back fond memories of our friends the Franciscan Friars at Our Lady of Lourdes. I'd also like to wish my brother B. a very happy birthday! Some words of advice for Catholic families. 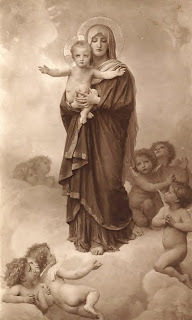 Talk to your kids about fasting and abstinence, especially on Fridays, since our dear Lord was crucified on a Friday. Tell them you are going to eat no meat that day. Ask them for help in coming up with some menu ideas. Explain how fasting means limited eating and no snacking. This applies to those over 14, healthy and non-pregnant or nursing. Fasting means only a minimum of foods between meals, this food should be essential type food and not junk food! Children can become quite vigilant with each other, and you, once they understand what fasting is all about. Gather together with the family for prayer once a day. If this is not a family habit, today is a great time to start. Perhaps at the dinner table, before everyone leaves, or just after the meal. Hear us, O God of our salvation! and issue not the decree for the completion of our days before Thou forgivest us our sins; and because penance avails not in hell, and there is no room there for amendment, therefore do we humbly pray and beseech Thee here on earth, that, giving us time to pray for pardon, Thou wouldst grant us also forgiveness of our sins. Through Christ our Lord. Amen. Take away, merciful Lord, all errors from Thy faithful people, avert from them the sudden destruction of the wasting pestilence; that those whose wanderings Thou dost justly chastise, Thou wouldst vouchsafe in Thy tender pity to cherish when corrected. Through Christ our Lord. Amen. Antiphon - Sin no longer, O my soul! Think upon the sudden change from sin to endless woe. There, in hell, penance is not accepted, and tears profit not. Turn, then, whilst thou hast time; cry out and say: Have mercy upon me, O my God! Antiphon - In the midst of life we are in death: whom, then, O Lord, shall we seek to be our helper, save Thee, O Lord! although Thou art indeed angry with us because of sins? O Holy Lord, holy and strong, holy and merciful Saviour! deliver us not ever to a bitter death. V. - Lest, overtaken by the day of death, we seek time for penance, and be not able to find it. R. - Hearken! O Lord! and have mercy on us; for we have sinned against Thee. We beseech Thee, Almighty God, receive in Thy fatherly pity Thy people flying to Thee from Thine anger; that they who fear to be chastised by the rod of Thy Majesty in the suddenness of death, may be made worthy to rejoice in Thy gracious pardon. Through Christ our Lord. Amen. We beseech Thee, Almighty God, graciously to incline Thine ear to the assembly of Thy Church, and let Thy mercy prevent Thine anger in our behalf; for if Thou shouldst mark iniquities, no creature shall be able to stand before Thee: but in that marvellous charity, through which Thou didst create us, pardon us sinners, and destroy not the work of Thine own hands by sudden death. Through Christ our Lord. Amen. O God! in Whose sight every heart trembles and every conscience is awed; show forth Thy mercy upon us Thy suppliants, that we, who trust not in the excellence of our own merit, may never know Thy judgments in the suddenness of our death, but may receive Thy pardon. Through Christ our Lord. Amen. Most merciful Lord Jesus! by Thine agony and bloody sweat, and by Thy death, deliver me, I beseech Thee, from a sudden and unprovided death. O most gentle Lord Jesus! by Thy cruel and ignominious scourging and crowning with thorns, by Thy cross and most bitter Passion, and by Thy goodness, I humbly pray Thee, let me not die unprepared and pass from this life without the Holy Sacraments. Jesus, my best Beloved, my Lord! by all Thy labours and sorrows, by Thy precious Blood, and by Thy most holy Wounds, and by those last words spoken on the cross by Thee: "Deus meus, Deus meus, ut quid dereliquisti me?? - "My God, my God, why hast Thou forsaken me?" and again: "Pater, in manus tuas commendo spiritum meum," - "Father, into Thy hands I commend my spirit," most ardently I pray Thee, save me from a sudden death. Thy hands, O Redeemer! have wholly made and formed me: ah! suffer not death to take me unawares; give me, I beseech Thee, time for penance; vouchsafe that I may pass from this life happily in Thy grace, that I may love Thee with my whole heart, and praise and bless Thee forever and ever.